It is THAT time of year again. The time when I am wracking my brain to figure out what my J-man would love for Christmas that won’t gather dust two days after he opens it. Spoiler alert: J-man, if you are reading this, close my laptop RIGHT now. Several years ago, when he was just two, we scored big with a Thomas set I bought second-hand from a friend and a few supplemented pieces. Immediately after seeing the set he lay down on the floor next to it and played for the next 14 hours straight. I am not even sure if he ate that day. 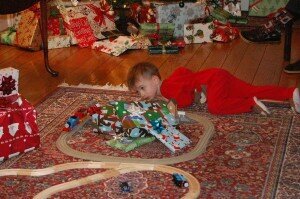 The Christmas of the Train. He stayed in that position until we made him change into new pjs and go to bed. The Chaos Tower was super cool, and J-man loved watching the ball travel through the entire mechanism, but all he did was watch. 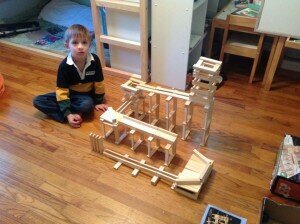 He was too intimidated by the number of pieces to take it apart and make his own configurations. 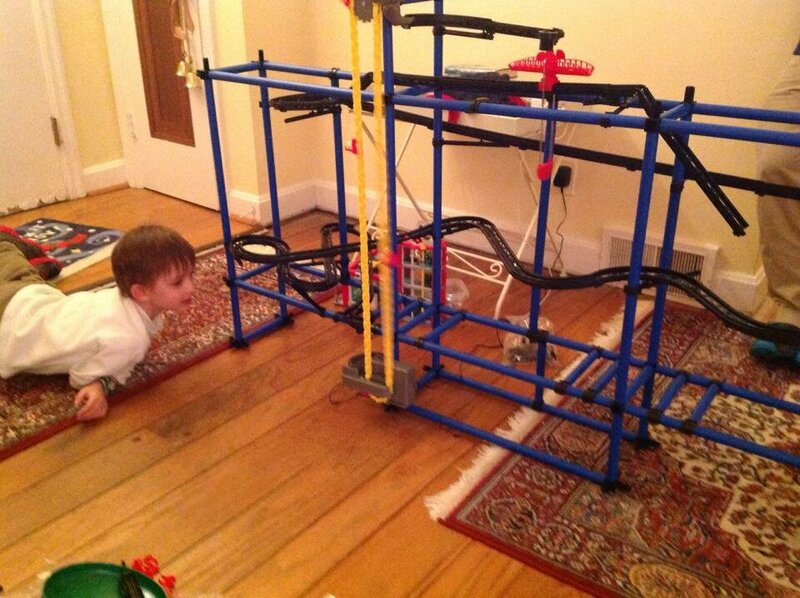 It is so big and complicated that he can’t really put it together on his own. When put together, it pretty much dominates any room. We had no concept of the size and, really after J-man watches the ball go from one end of the set to another for awhile, he is looking for something else to do. Unlike the Chaos Tower, Contraptions spark the imagination, can be done alone or with a partner, and can be changed easily. This toy was a definite hit. He built that himself and he was about five or six in this picture. The key here is to find something he can do independently, but has more fun doing with a partner. He still gets out the Contraptions at eight. If we were looking at a cost per use figure, it would be pennies. This year, we are keeping these lessons in mind when seeking that special gift for our buddy. 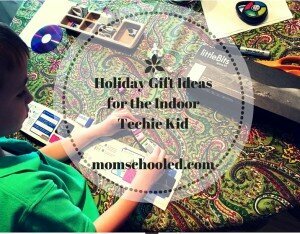 J-man is hugely a techie kid, so if your kid likes all things computer and gadgety, this is the list for you! ****NOTE He will ABSOLUTELY not be getting these things. He is generally happiest with one big toy and a few smaller things that he really loves. We do not believe in showering kids with loads of new toys that they won’t play with just so they can have something to open on Christmas morning. This would be a huge reach for us, but he has been asking for it for two years and he is already in a Lego Robotics class. If we could pick up one on eBay, we would be done. It is pretty safe to say his mind would be blown. Why we love them: This system builds on (see what I did there…builds on Lego? Builds…I crack myself up.) 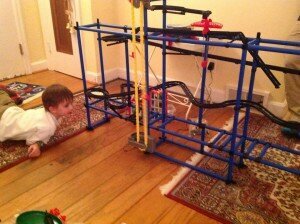 a kid’s experiences with Lego and Technics by adding a programmable robotic element. Here kids start to learn the fundamentals of coding with something that is tangible, not just a computer screen. J-man likes robotics like he likes oxygen, so if we can swing it, this would be a home run. Kano: Don’t just use a computer, build your own! This is a new product to us, and we are really excited by it. This product allows kids to actually build their own computers. Kano is a pre-boxed set of computer components that kids put together to create their own laptop. Many STEM programs and often many of the Makerspaces we have attended seem to be about “exposing” kids to technology. The challenge with that is “exposure” just creates consumers of technology not creators of new technologies. Kano teaches kids how to make their own tech. Feeling the power to make their own cool things will hopefully become a feeling that kids want to nurture and repeat. Plus, a new computer! I know. I KNOW. I’ve talked about Little Bits before. But, folks, these things are great. I watched one of J-man’s friends introduced to one of these sets today and she was instantly obsessed. While we have a couple of sets, the Smart Home Kit gives ideas for practical uses of the little bits circuits. Robots that you can make follow paths made by markers. different colors in different combinations act as codes, telling the tiny bots what to do. This is the kind of toy that would drive cats crazy! I am not sure about it’s longevity. While super, super cool, I am not sure how long children will really be enamored of this. While they can make the bots do hundreds of combinations movements, I am not sure that would be enough to keep them interested over time. However the price is relatively low enough, so it wouldn’t be soul crushing if it sat on the shelf after a couple of months. So, these are some of the bigger things we are considering for our little tech guru. 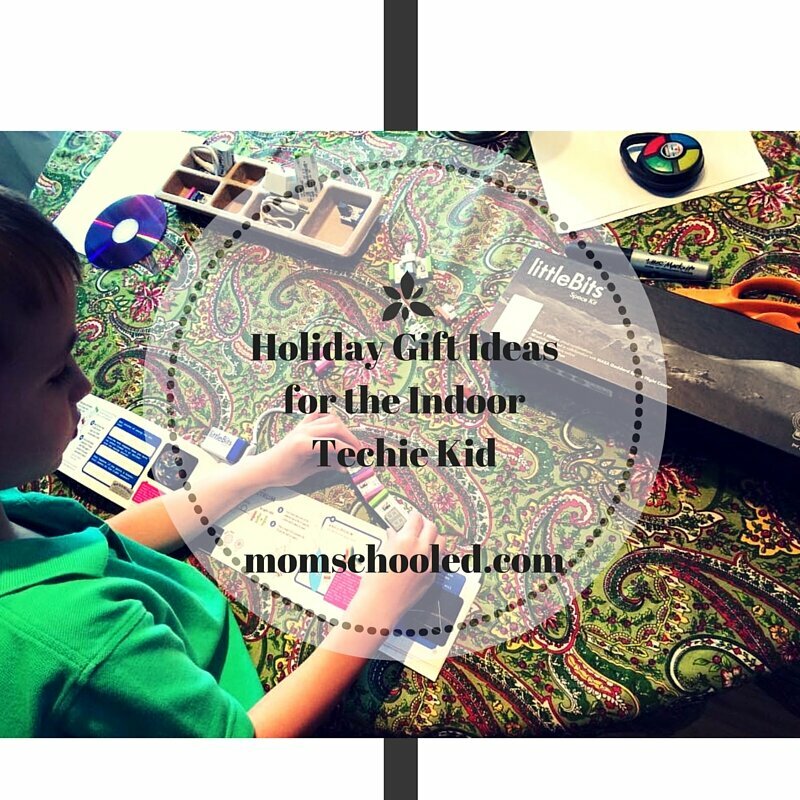 What techie tools are you considering for your future Silicon Valley star?